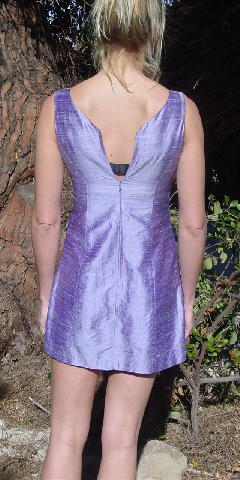 This 100% raw silk light purple with a touch of lavender sleeveless dress has a 100% pink with a touch of lavender lining. The front picture has a more accurate color. There is a 9 3/8" deep V neckline and a 7" deep V back. The back has a 15" long zipper. The tag says size 2, but it fits like a 0/2 Petite. Because of the model's height (5'11"), the zipper was not zipped all the way up in the back picture.